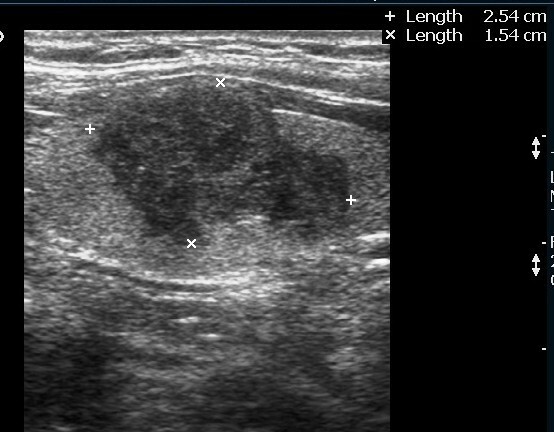 A 27 year female complained of swelling in left side neck and it notably increased over a period of 6 months. Cancer of the thyroid is the most common endocrine malignancy. Some 5-10% of patients with thyroid cancer will die of their disease. 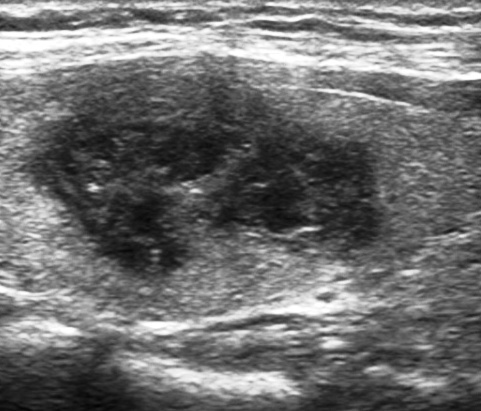 Ultrasound features of a malignant thyroid nodule : solid, hypoechoic irregular margins, absence of a hypoechoic halo around the nodule. Hypoechoic lesions have a higher risk of being malignant. Lymphadenopathy and local invasion of adjacent structures are highly specific features of thyroid malignancy but are less commonly seen. Follicular thyroid carcinoma originates in follicular cells and is the second most common cancer of the thyroid, after papillary carcinoma. About 15% of all thyroid cancer cases are follicular thyroid cancer. Follicular thyroid carcinoma (FTC) is a well-differentiated tumor. They are slow growing but have tendency to spread via the bloodstream and disseminate to bone, liver or lung and rarely metastatize to regional lymph node (incidence of <10%). Thyroid neoplasms arising from follicular cells (adenoma and follicular carcinoma ) show a broad range of overlapping clinical and cytologic features. Therefore it is impossible to distinguish between follicular adenoma and carcinoma on cytological grounds. If fine needle aspiration cytology (FNAC) suggests follicular neoplasm, histopathology is required to establish the diagnosis. Features for the diagnosis of follicular carcinoma are capsular invasion and vascular invasion by tumor cells. Foci of capsular invasion should be carefully evaluated and discriminated from the capsular rupture due to FNAC penetration resulting in WHAFFT (worrisome histologic alterations following FNA of thyroid). Minimal invasive follicular carcinoma is well encapsulated as compared to widely invasive follicular carcinomas. A diagnosis of minimally invasive carcinoma can be made either on the basis of capsular invasion alone, vascular invasion alone, or the presence of both types of invasions. Hurthle cell thyroid cancer is often considered a variant of follicular cell carcinoma. Hurthle cell forms are more likely than follicular carcinomas to be bilateral and multifocal and to metastasize to lymph nodes. 1) To evaluate the postoperative thyroid bed for the presence or absence of any residual disease. 2) detection of local and nodal tumor recurrence. 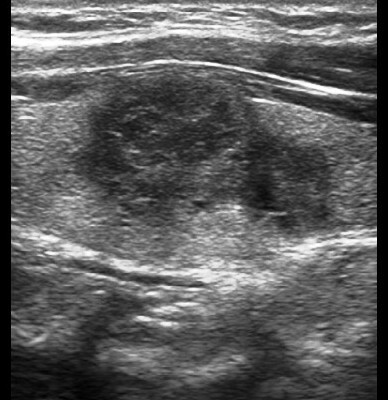 Post-operative suture granulomas may appear as hypoechoic nodules with coarse echogenic foci casting posterior acoustic shadowing in the thyroid bed. This appearance may mimic that of recurrent carcinoma. Prognosis of Patients with Papillary or Follicular Thyroid Cancer by Sheldon Rubenfeld, M.D. Yousem DM, Scheff AM. Thyroid and parathyroid. In: Som PM, Curtin HD, editors. Head and Neck Imaging. third edn. St Louis: Mosby; 1996. pp. 953-75. Solbiati L, Livraghi T, Ballarati E, Ierace T, Crespi L. Thyroid gland. In: Solbiati L, Rizzatto G, editors. Ultrasound of Superficial Structures. London: Churchill Livingstone; 1995. pp. 49-85. Noyek AM, Finkelstein DM, Kirsch JC. 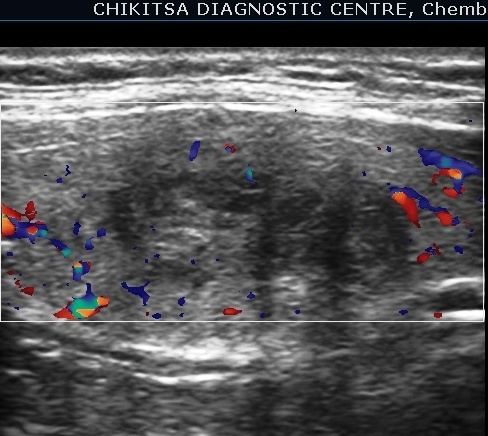 Diagnostic imaging of the thyroid gland. In: Falk SA, editor. Thyroid Disease: Endocrinology, Surgery, Nuclear Medicine, and Radiotherapy. New York: Raven Press; 1990. pp. 952-75.